Dun Ailinne, Gathering place for the Leinster Kings? [singlepic id=188 w=320 h=240 float=right]While Old Kilcullen is generally regarded as the settlement from which the modern town of Kilcullen sprung, there’s another hill just across from that monastic centre which predates it by a long shot. Excavations and other investigations of Dun Ailinne (the Beautiful Fort) have established that it was the scene of major and regular gatherings going right back to Neolithic times. It is the largest pre-Norman earthen enclosure in Ireland, covering some 44 acres. The ditch or ‘henge’ which circumscribes it is the best preserved and largest such feature in Ireland. There are some references to it in the much later literature from the period when monks holed up in the Old Kilcullen Round Tower against raiders, including at least two Viking episodes. But much of what we understand it to be now comes thanks to the work of the late Professor Bernard Wailes of the University of Pennsylvania, who carried out a number of excavations during the late 60s and early 70s. His work unearthed a complex sequence of constructions and ‘finds’ demonstrating Neolithic/Early Bronze Age, Iron Age and Medieval occupation. [singlepic id=185 w=320 h=240 float=left]More recent geophysical investigations by Dr Susan Johnston of the George Washington University added new chapters to a story that suggests Dun Ailinne was a nexus for tribal communication, spirituality and probably the commerce that would be part of a large coming together of people from many parts. There are mentions of Dun Ailinne in documents from about 800 AD onwards, including one which lists the ‘overthrowing’ of ‘pagan’ sites in favour of the new Christianity. Kilcullen itself has recognised the importance of Dun Ailinne to its own modern position. As the ancient feature is on private land, the community has provided a Dun Ailinne Interpretive Park at the south end of the town. With a magnificent sculpture centrepiece based on a spearhead found during the Wailes digs, the mound and ditch park is appropriately at what was once a key junction on the main road south from Dublin, where the Carlow and Athy roads went their separate ways. The sculpture was designed and produced by local artist Noel Scullion, and has a number of interactive elements which mark the times of year that may have been particularly important to those who came periodically to Dun Ailinne. These include the Spring and Autumn Solstices, when the rising sun, if visible, bursts through a carefully aligned hole in the edifice. There’s also a feature related to Midsummer Day. 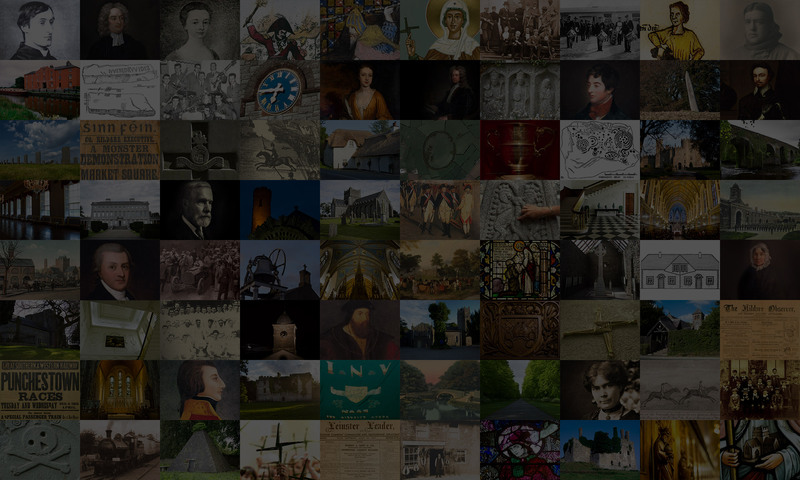 A board with eyecatching graphics and information in both English and Irish offers a timeline of the site’s known and surmised activities. [singlepic id=186 w=320 h=240 float=left]The Interpretive Park was officially opened in 2008 with guest of honour Bernard Wailes making an emotional return to the place where he carried out the work for which he will be best remembered here. A special ‘Dun Ailinne and the Clann March’, commissioned by Kilcullen Community Action and sponsored by Sir Anthony and Lady O’Reilly of Castlemartin, was composed and played for the occasion by renowned piper Liam O’Flynn. Dun Ailinne is ranked in archaeological importance with Tara, Knoc Cruachain (Co Roscommon), and Amhain Macha (Navan Fort, Armagh) although it has never received the same public attention because it is on private land. It is currently being assessed for consideration as a UNESCO World Heritage site. Dr Johnston has applied for funding to carry out further geophysical exploration of the site, of which approximately 25 percent has been investigated. Professor Wailes died in April of 2012. Two upcoming events focusing on Dun Ailinne. Join archaeologist Padraig Clancy to examine the physical evidence for this forgotten hub of power in his lecture on the 20th of July 2013 in the National Museum in Kildare Street. Details here. A rare chance to visit this Royal site for the Kings of Leinster guided by Conleth Manning on the 25th of August 2013. Details here.